We so enjoyed the 20-year class reunion in 2004 that Steve Reid (my husband and our erstwhile classmate who joined the class below after taking 3rd year out to do a BSc Med) and I were determined not to miss the 25-year reunion. We also tried to encourage as many of our class who had missed the 20-year reunion to come. For us, an occasion like a class reunion is an opportunity to pause and reflect on our lives, both personal as well as professional. In a busy and full life with constant pressures and deadlines, it is not easy to be disciplined and to set aside time to do this. The process of reflecting started with being asked by Joan Tuff, the Alumni Officer and organiser of the reunion, to fill in a form a few months before with some of our professional and personal details, which was then complied into a very useful booklet and given to us on the weekend. Providing this information to Joan started us thinking about family, achievements and memorable moments. It was wonderful to connect and have time with friends and classmates, many of whom had flown in from far, far away (is Vancouver the furthest place from Cape Town?). There are people who would really have liked to come, but were unfortunately unable to do so because of their circumstances. However, there were certainly some who could have come (who were in and around Cape Town) who chose not to attend, which was sad. 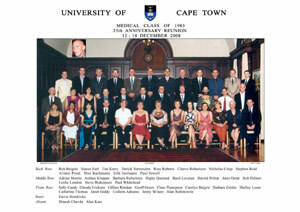 We were a special and unusual class, and lived through a traumatic, dramatic and exciting time in South African history. This was a very formative experience for many of us, as Wendy Orr so eloquently and movingly testified to, at our 20-year reunion. For those of us who became involved in different ways in the political struggle, many of our relationships were formed and strengthened in this context. This is particularly poignant for those of us who have left the country and established different lives in different contexts. Returning to the medical school and meeting up with old friends served as a reminder of the depth and strength of those bonds, with special individuals and a special country. The opportunity to connect again after many years and many significant experiences was a unique and unrepeatable experience. I do not think it is about comparisons and competitiveness (although that can also happen), but rather about connecting and reflecting. It is an opportunity to evaluate and take stock, and although that can potentially be difficult, it is also a necessary and important process. Some people look very much the same (Nick Crisp still lean and mean), some more "distinguished" and professorial- looking (Leslie London), some still hunky (Alan Rabinowitz, and he is still single!) and some … well, let us say "more senior" in appearance. Many of the ladies definitely more stylish and up-market – Cathy Thomas used to be quite "ethnic/muesli" and now she is super chic. It was pointed out to me (more than once) that I had neither changed my hairstyle (one long braid) nor clothes style, in 25 years "I remember you wearing that exact dress when you were a student" (it is not true!). The variety of events over the three days gave a chance for people to connect with many former classmates in different ways and contexts. Some people attended all events, some just one or two. Some had spouses accompanying them for most events (faithful Ron Begbie), and some brought their children to some (Geoff Green's gorgeous girls). This open ended, flexible programme was an excellent way to try and accommodate different expectations. For those of us who had left Cape Town soon after graduating, the visit to the Transplant Museum was particularly poignant. The last time that we had walked through those doors into the old Groote Schuur Hospital was as students or interns entering a fully functional, grand old lady of a public hospital. To see it now, deserted, with deathly quiet passages and theatres, restored to some even earlier era was strange indeed. A wonderful opportunity to pay homage to the institution from which our career courses were set, and a reminder that we belonged to an Alma Mater of great history and tradition. At the Friday evening cocktail party the Dean, Marian Jacobs, was warmly welcoming, and we appreciated how many of us she remembered personally. It was a very festive occasion with one or two of us perhaps not matching our intake of solids (delicious eats!) with the available liquids (alcoholic beverages) and suffering the consequences. The highlight for us, as before, was the "Academic Day", in which various people presented topics of their choice. There was a wonderful atmosphere that morning as we all shared different aspects of our personal and work lives. In the presentations, Primary Care, Family Medicine and Public Health were the best represented (Max Bachman, Shelley Louw, Alan Katz and Nicholas Crisp), then came Psychiatry, with talks by Glenda Ericksen, Cathy Thomas and Digby Quested (very intriguing view on the origins of schizophrenia). Geoff Green tested our general and medical knowledge with a quiz, inserting questions all though his presentation on celebrity stroke. Lastly there were the "stand alone" topics with Paul Jowell teaching us about pancreatic surgery, Alan Rabinowitz, who I hypothesise has got a bit bored with mainstream cardiology, and has developed a passion for the potential of electronic patient records. Steve Reid introduced his talk on Music and the Medical Consultation by playing an Irish jig on the violin. My talk on Reflections of a South African HIV doctor, traced the evolution of a career path tackling the worst ever global pandemic, which we had not even heard about as medical students. What made the time special was the atmosphere at the presentations: it was serious, in the sense that people are doing significant and often cutting edge work / research, and yet people engaged in a very open, real and bantering way with each other. An AIDS dissident in our class threw me a bit of a skew ball from the left in question time, in an attempt to "rattle my cage" as she put it. In my experience AIDS dissidents do not have a serious argument ("show me the HI virus under a microscope"), they mostly want public air time. Clare Thompson, the class facilitator, handled it well ("Ladies, perhaps you would like to discuss the issue in more detail over a cup of tea, we do need to move on now"). For me, the most sobering talk was Nick Crisp's "Reforming the Nigerian Health System – A One Hundred Year Project", in which he made it graphically clear (lots of photographs) that if you let the Health System run down, it is very difficult and takes a long time to fix. I am relieved to know that Nick is a consultant advising the new Minister of Health, Barbara Hogan. We booked for the Robben Island tour because it had been on our "to do" list for years, but we'd never got it together to do it. It was a very moving experience, but a bit too "packaged". I would like to go again and next time spend a few hours walking around without a tour guide. For many people, the formal dinner in Smuts Hall was a blast from the past, no doubt evoking many nostalgic memories, including the venue of the photograph in the upstairs lounge where some of us enjoyed folk music evenings (one of my first dates with Steve …). It was perhaps not ideal from the acoustics aspect, which being suboptimal, slightly sabotaged our attempt to systematically go through the class list as a group and try to account for where every person was, what they were doing, and any other interesting facts (past or present) any one could remember about them, leading to wonderful anecdotes and tangential stories. In between we enjoyed delicious food, had more memorable time to catch up with classmates (and their lovely partners), including dear Gavin Hendricks who put in an all too brief appearance. It is fascinating to have a glimpse of what has happened in people's lives – the choices they have made and how their values have been shaped. People were curious about children – how many? what age? boys or girls? Between us all we have children ranging in age from 26 (Barbara Robertson, who is the first grandmother in the class as far as we could work out) to those still planning to have children (Alan Rabinowitz), and quite a few sets of twins. Three of those gathered for the reunion have a child studying Medicine at UCT: Cleeve Robertson, Clare Thompson, as well as Steve and I (our second born, Joanna, had just finished 2nd year MBChB). There was pleasure in connecting with people who had not necessarily been particular friends, yet there was a feeling of wanting to get to know more about this person; like Harold Pribut, a paediatric cardiologist who looks after my sister's child, who had transposition of the great vessels. Digby Quested is so very much an Oxford academic, and even his name seems a perfect fit for his life in the heart of British academic life (on a "quest" for deeper knowledge about schizophrenia …). The reunion ended with a grand finale – a picnic in Kirstenbosch Gardens, complete with wonderful food and wine. This provided the opportunity to "chill" in the magnificent surroundings, and we were joined by a few classmates who hadn't made it to the other events. One of the enduring memories of this reunion was being shown the two baby eagle owls nesting in a tree near to our picnic site - gorgeous, smug bundles of feathers with huge eyes. There are not many places in the world would one stand ogling at such a sight, at a reunion. There were a number of additional impromptu "during" and "after" parties in addition to the official arranged events. Cathy Thomas, Max Bachmann and a few others met at a bar in Mowbray on Friday night and exchanged increasingly colourful stories of times in the Bush, oiled by copious quantities of alcohol. Nick Crisp invited Steve and I and Alan Rabinowitz to a braai at his home in Fish Hoek, where we enjoyed meeting his family and talked more deeply about the challenges facing the South African health system (a seriously serious topic). We were encouraged that a classmate, who is now a Canadian, is still so concerned and cares deeply about what is happening in South Africa. We had a great walk and talk on the beach at Kommetjie with Cathy Thomas and Max Bachmann, who live in Norwich with their twin boys. Many thanks to Joan Tuff, for all her perseverance and persistence in tracking us all down, for patiently communicating and making all the logistical arrangements. Thanks also to Clare Thompson, Colleen Adnams and Carolyn Baigrie who assisted with many aspects of the planning. Clare, you did a great job as MC of our Academic morning - keeping us on track and focused! I look forward to our next get together (40th), by which time we really will all be old and wrinkly, and it might be even more of a challenge to recognise each other, as I will by then probably have finally cut my hair. We will definitely need BIG name badges!